Twin brothers and cane growers Tony and Chris Rossi talk about water quality challenges, from the banks of the Mulgrave River in Cairns. Introduction:The Great Barrier Reef needs to be fighting fit to cope with climate change. While the world takes action to address climate change, improving water quality is the best thing we can do to increase the Reef’s resilience. Runoff from the neighbouring catchment can cause all sorts of problems when pollutants end up in delicately balanced reef ecosystems in his podcast series we talk to farmers, scientists, extension officers and local experts to hear their water quality perspectives. 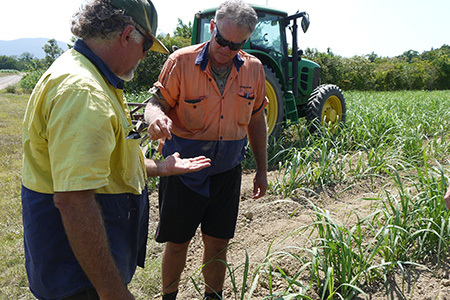 In this episode Cairns canegrowers and twin brothers Tony and Chris Rossi answer some tricky water quality questions we threw their way, sharing their many years’ experience growing cane in a Reef catchment. Tony Rossi: I'm Tony Rossi, I'm a cane farmer in Mulgrave mill area and I'm also the chairman of the Mulgrave Landcare and Catchment Group. Before coming back to the farm I was working in the sugar mills as a sugar technologist working as a chef chemist worked at Mulgrave mill for about 10 years and then all were also down at the Harwood sugar refinery making white sugar. Chris Rossi: I'm Chris Rossi and I'm a cane farmer on the Mulgrave river. I did my time as a fitter and turner in the local sugar mill at Mulgrave mill and have been on the farm since I was about 22. 30 years we've been on the farm full time. The original grandfather came here from Italy in 1924 and our father Rick is now 91 years old and he was born, has lived all his life on the farm on the river. Chris Rossi:So we've been here pretty well for 80 or 90 years now. Tony Rossi:We're the youngest of five sons, four of us are actively involved on the farm and the oldest brother Peter is a photographer in Cairns. Tony Rossi:But the nature of farming these days and the amount of exposure we get to water quality and fertilizers and that it's actually a real advantage to have that bit of a science background and we're all working really well together and we all bring something else to the partnership. Chris Rossi:The lovely valley we live in here it's only three or four kilometres wide and it's the Mulgrave area basically goes from the city of Cairns down to the Babinda area or north of Innisfail. It's a little coastal strip with a big range that goes the full length of it. Very fertile soil very high rainfall. We're lucky we live on the river. A lot of farmers don't have a river through their property but we've got two or three k's of river frontage so we've always been exposed to the river and everything that goes with it. Tony Rossi: And all of the little farm houses out here on the Rossi farm were all perched within 20 metres of the river and people often say ‘why is that?’ and the fact of it is that 95 percent of this river farm goes underwater in the floods. So the high ground is actually perched right on the river. I guess being river folk has really influenced this and we've all grown up fishing and loving all nature so that's why it's sort of got in the way of way we farm that we want to have as little impact on the environment as possible while still being highly productive farmers. Chris Rossi:Well I think what we really notice is that things have changed for the better a lot more now. When we were young all the cane was burnt and the ground was cultivated every year was cultivated, fertiliser and chemicals were applied then onto basically bare ground and was very erodible in this high rainfall area you'd get a lot of runoff. There was no protection. There was no ground cover as such. So the big change happened in the late 70s and early 80s we went to green cane trash blanketing that's where the crop was starting to be harvested green. So no more the old cane fires and the residue was left as a mulch on the ground and it did help a lot in the drier parts of the area to keep moisture, help keep weeds down. It brought a whole new lot of practices and in the old days a lot the fertiliser was just applied on top of that trash. Then when we were into the green cane trash blanketing at first it was very hard to apply the fertiliser because the ground wasn't cultivated anymore so you couldn't use conventional ways of pulling tines to the ground and putting fertiliser into the ground. So the first option was to just scattered on top. That's how it really started to be spread on top. Or they might rattle some chains but it didn't sort of have the technology right to get that into the ground. And later on they started using coulters which are like big discs probably six to 10 mil wide and they were used to actually cut through the trash blanket and then using tines were able to put the fertilizer into the ground and a lot of people moved to that then even a bit further on probably another 20 years ago we went to what's called stool splitting and that's what most people do now where if you can imagine the stool of cane where the cane growing out of the high part of the stool when it's been harvested in the cane gets back up about a month old kind of had this high you go through with machines that actually cut right into that held up stool and apply that fertiliser straight in then it's captured in the root ball of the cane basically (four or five inches down) there a lot less run off and we get a really fast take up of the fertilizer too so just as a general rule we're probably using at least a third less fertilizer the than the old cultivated days and people have really cottoned on. In the old production was everything and you just grew as big a crop as you could. You almost want to try and stop the mill with a bigger crop you could grow and you wanted to harvest is all struggle that was sort of have farmers used to operate. Nowadays most farmers realise that the application of fertiliser they put on is directly linked to the quality of the crop they'll grow. So you want to grow a good crop of cane but you want to be sweet so you don't over fertilise. And most farmers know that. Tony Rossi:And I think you know following on from those practice changes that really have improved everything in the industry we're taking it to the new level now where we're looking at minimizing our inorganic fertiliser we use and going back to some of the traditional things like a legume fallow that provides a lot of nitrogen work going into composting is also really supplementing that cutback in the inorganic fertilizer. We're now getting a lot of our nitrogen organic carbon phosphate and potash from the compost blends that we put into our plant cane and that's all quite a stable system too because we apply that about 40 tonnes of the hectare into the bottom of the plant drills and then traditionally when you would normally top dress but we now top dress with the compost and then we heal up over it. So we really are capturing that organic carbon in all the compost right above the root ball and then we're getting the wet season come through and gravity. And even when that crop’s harvested the next year that compost is still underground and continues to give because we have learned that the nitrogen only probably gonna get 15 percent of it per year. The phosphate’s a bit more available probably 40 percent a year and the potash is readily available. You get up to 90 per cent and that's one of the advantages of the compost it's actually very high in phosphorus and potash and they're usually the expensive components of fertiliser. So there's been a few unexpected benefits from it all. Tony Rossi: Well the two main ways that nitrogen is lost from the cane field is through runoff which is sort of you think of a big rain event and if fertilizer was just laid on top it can run away certainly more stable if you're putting it into the ground has less chance of it. And the other loss of nitrogen is that as it migrates down through into the water table and that's a hard one to control because things like trash blanketing and stool splitting have largely controlled the runoff off the top. So now the challenge is feeding that crop the right amount of nutrients so that you actually also minimising that leaching that's going down. Chris Rossi:And that's why we do a lot of farms a lot more. We have soil testing now. It's a very important way to find out if you're deficient in any of these elements. It's also a way of knowing whether you need to put these expensive lime and things like that. Sometimes you don't need it. Most farmers soil test now in all their plant crops. That's a bit of a requirement these days. Chris Rossi: Weather forecasting so much better these days in the old days was very haphazard and it was a laughing stock almost. Farmers wouldn't believe that most of the time nowadays I'll say it's going to rain on a Thursday afternoon and you can pretty well set your watch by. So they've got a better handle on that. Tony Rossi:And then look longer term things like El Nino and La Nina events we understand them a lot better these days generally El Nino means we can have a drier than normal year here. The good things is the Cyclones tend to stay out in the Pacific with the El Nino. La Nina bring more heavy flooding. But I guess that's one of the great things about the cane. One of the other tools we have these days is G.P.S. technology and it's not just about having straight rows it can tell you the altitudes of your paddocks as you're traveling over them so it allows you to help with your drainage or irrigation if you irrigate so you can get a general feel instead of the old days was all sort of having a look and even marking rows was setting up sticks and trying to keep it straight. We find it it's so much better when you are tracking with the satellite because all of you where you plant the cane you also work it, hill it up and we even harvest now with the G.P.S. in the harvester as well. All the spraying can be done with that so it’s a bit more precision. There's certainly savings in fuel and that when you're working ground because you're not used to always sort of double up a bit you didn't miss a bit. Now your machine knows we're doing a three metre swathe here and it does another one next to it so yeah there's a little savings like that it's quite expensive technology still at the moment but the two or three years we've been running it. We're loving it and I reckon it's paid itself off in two or three years. It has been a bit of a yield decline through the industry and as things like the inputs like fertiliser got very expensive it's sort of linked to the fuel prices and that and fuel and all these things are really impacting farms. So you do find people cutting back and their production has slowly declined and you do see decline in the soil. A lot of these farmlands have been farmed for over a century now just mono cropping sugarcane basically in this area and we've basically seen a general depletion of the organic structure that was there in the soil. A lot of farms will tell you when they first opened the ground up it's very fertile and it's that something you don't see that many years. That's sort of what led us onto the compost was it was the ability to bring if you think trees haven't been part of the paddocks for 100 years and by using a wood based which is one of our main ingredients in our compost we are able to bring that that wood and all the associated fungi and bacteria that haven't been there for 100 years so we've had a lot more we have soil biology now, most farmers that are just starting to get that idea. They always thought it was just put the bag fertiliser on and kill any insects and everything else out there but largely it's a big balance. You've got to have the soil biota there and that's what builds good soil. Chris Rossi: What do you think about water quality modelling? I guess farmers should be really quite happy with this end of catchment monitoring now because anything that happens in this little valley will end up getting picked up in the end of river catchment and they're looking for things like pesticides and excess nutrients and that and it's generally a good news story. There's been so much progress made in and at least now these catchments are being monitored so it helps people focus on what the special issues are for their catchment and sometimes it'll be more about sediment control. But here where we largely cut cane green and have trash blanketing we've largely got sediment controlled here now. So now it's trying to minimise nutrient runoff and being sensible about pesticides application and you're just looking to the weather and being mindful of things like that. Chris Rossi:I think a lot more farmers need to see those figures because Tony and I are involved in Landcare. So we do see these figures regularly because our group help with the monitoring and collecting of the samples so we're exposed to and we can see the good news story. I think if a lot of other farmers saw that they they'd keep an eye on their neighbours to make sure they're not using chemicals they shouldn't and over fertilising things so if they could see it regularly I think it'd help all of them. It'd be a good tool for all of them. Tony Rossi:Yeah. And look whether the other good things so you've got their monitoring happening at the end of the catchment. The State Government is also through a couple other projects is working back and putting some other automatic sampling in to take in things like the sugar milling and the sewerage plants of the local towns. So basically just working back up the system so that you can get a bit of a feel where these issues are happening in the catchment. Farmers are happy to take responsibility for their effect on the environment. And that's really why we do need actual monitoring and water sampling. And as that works back up the catchment I think farmers can be proud of what they are doing. If there is a problem or something raises its head I think farmers are really good at reacting to things they need to. So if they can have someone prove that it's something to do with them well they'll take action. Tony Rossi: and as you see the water quality monitoring figures. They're really interesting because not only are you getting regular background results but you do see in the storm events or the flood events the first runs that's often when the loadings of pesticides or nutrients are at their highest. And having that fed back to a farmer really can explain how things are leaving his farm and probably on 350 days of the year there's probably nothing leaving his farm but understanding those events is very important and our local sugar research have done a lot of that sort of work and use things like their rainfall simulator with all different chemicals to just find out how stable some of these chemicals are and some of them definitely run away quicker than others. So you know there's a wealth of information for farmers and anyone that is exposed to it is generally learning as they go. Chris Rossi:Do you think farmers and scientists want the same thing for waterways and the Reef? Tony Rossi: Well I consider myself a farmer and a scientist and there's not really much difference. A farmer is a person that's working in the landscape so it's very similar to a scientist. And I think we all generally want the same thing. We want to be able to feed our families and make money but we also want to minimise the impact we're having off farm. I think it's very important that we get that concept that landcare issues and that should become part of our core business. Chris Rossi:I think every farmer no matter where he is always wants to think he's improving his ground and not just pillaging it so that's a general rule to every farmer I think. I think in the north the sugar cane will always be the best crop because it’s really well suited to the high heat and the rain and it's not as susceptible as the tree crops to the wind damage that can happen with cyclones very regularly in north Queensland. So I think sugar cane at the moment we are just making sugar out of it and there's hundreds of products apparently that can be made from it. The obvious ones are ethanol and things like that that we should be moving towards those sort of fuels and there's big future in plastics and biodegradable products and that's the future. Sugar cane will always be here because on these river flats very few other things will survive the floods and weather. Tony Rossi:I think after 100 years of monoculture sugar cane we're all seeing the benefit of our legume fallowing in these other crop sneaking in not just classic legumes like soybean and cow pea. People are starting to put mixed species in so you're getting sunflowers and sun hemp, sorghum. People are putting in a mix there and I think there's a general understanding that to improve your soil biota the more diversity you can get in there you'll break some of these pathogen cycles. Tony Rossi: Do scientists listen to farmers? Chris Rossi:I think they do. You know we've had exposure to quite a few different scientists through SRA and CSIRO and even through our Landcare group we've had a lot of people talking to our group. So yeah I think there’s always interest in what we're doing. I'm not saying every farmer and every scientist get on. I think the farmers that are switched on can see the benefit of the science and there has been a general move against science by the general public and I think people don't believe science anymore like, sceptics about climate change and things like that so I think it's been sort of undervalued a bit these days but I still like to think they’re the smart people and we can both help each other. Scientist’s would be mad if they didn't listen to farmers and vice versa because the farmer is really that person on the coalface that’s dealing with it and has that experience. Some of these 80-year-old farmers have been seeing things for many years and a farmer often if he can feel that someone's listening to him. It's a great partnership, a scientist and farmer. I think as people do accept things that like climate change are real. You end up with a lot less conflict in your brain because farmers can actually see things have changed since their father and grandfather's day. And if our society in general can get on and accept things and be proactive we're all gonna feel a lot better because we're not going to waste resources trying to deny things that we’re seeing in the landscape so I think farmers even though they can be thought of as a conservative mob are really realists too and in their hearts they know things are changing and anything we can all do is going to be good. But also farmers don't want to feel they're the only ones holding the can. Things like water quality is so important for the Reef. But the bottom line is the biggest issue for the Reef is the temperature of the water and the bleaching events. As that water increases whether you say it's manmade or not the bleaching events are going to happen more often. So by all means yeah water quality is gotta to be as good as possible so the Reef can recover and be resilient but it's everyone’s responsibly not just farmers that we all face up to things like climate change. Do farmers trust scientists? I think they do. If they work with them and see how they set trials up. Farmers are very good at harvesting trials and they’ll keep records for that sort of data. If the data stacks up and is done properly they will trust it for sure. What can we do better to explain water quality monitoring and modelling? It's a matter of using the two… look at closing the loop and keeping farmers getting the feedback to the farmers is very important. We're quite lucky in the sugar industry we have a lot of extension we are exposed to a lot of things that at our shed meetings scientists are quite happy to come and talk to people about that so I think as farmers get more and more exposed to the numbers and the results, that can only be a positive thing. Things like Smart Cane BMP and Best Management Practice, look it takes a while to go down that track because things like record keeping, it is very hard for farmers and especially farmers that aren't computer savvy and it seems like a bit bureaucratic. But as farmers realise that they do a lot of ledger work anyway just running their business and they've really got to start to looking at things like record keeping which is most farmers are doing so much of the best practice stuff already. It's a matter of that bit of discipline, keep a little notebook write all your spraying and fertilising and that. Transfer it, get the kids if you don't understand it, get them onto the computer and really that's the last key in at all to being able to say that you are a best management farmer. It's not easy but once you get your templates and get into a system it really is just like paying your bills and all the other invoicing farmers do. So I encourage them to get on board. One thing that you sometimes hear and I think back to my uncle and father and how they worked in this landscape, they did a lot of bulldozing, pushed a lot of trees over, filled a lot of wetlands and swamp turned it all into cane land and you know opened up a lot of the country and now and again you do get that feedback that ‘oh gee they'd be disappointed you guys are making wetlands and planting trees’ and I know they're not disappointed because they were men of their time and they were doing what was right and we are men of our time and the game has changed, the expectations of farming have changed and so what we are doing we're still about production but we just see things like establishing wetlands in the right places and planting trees in the right places are the way to go. We're very proud of what we do and we're very proud of what our fathers and uncles did because they were doing what was right at the time. Chris Rossi:The other thing is Tony. Everyone lives in a catchment whether you're in a city country farm or whatever. And everyone always says ‘they should do something about it’. We are they. This is acting locally, thinking globally, that's where you can make the change in your community and stop just whingeing about it just get out there do it and you'll feel good.